For building u-boot, use the hyundai_a7hd target. Use the sun4i-a10-hyundai-a7hd.dts device-tree file for the mainline kernel. 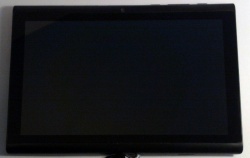 There are 4 buttons on the A7HD, the left one is the powerbutton, and any of the three other buttons can be used to trigger FEL mode, as described in the FEL mode howto. The A7HD has a known issue with less than ideal WiFi reception. The fix is to re-route the WiFi antenna, but in order to do that you need to partly disassemble your device and remove the back. Further information can be found in this android forum post. The A7HD suffers from the same problem as other A10 devices. When you power down with the UART still attached, some power continues to flow into the device, and it will not power down properly. So disconnect the UART if you need to do a proper power down. 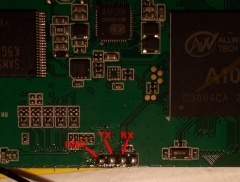 There are some pre-tinned pads available on the front side of the motherboard, right next to the SoC. All you have to do is attach some wires according to our UART howto. Use very thin wires to export this UART, as otherwise you will get pressure points on your LCD and your back cover might not fit properly anymore. Sold as Cherry Mobility M-728 by the Kruidvat store chain in Holland.